Editor’s Note: Russell Baker, the Pultizer Prize-winning columnist for the New York Times, died this week at age 93. The longtime Nantucket summer resident occasionally had a few words to say about the Vineyard. The following appeared in the Gazette in 1982. Seventeen years ago, deciding to vacation in one of the watery parts of the world, we wrote to chambers of commerce of a dozen islands chosen at random off a road map of the northeastern United States and had an answer from Nantucket a week later. It contained full-page descriptions of two dozen houses available for summer rental. We’re still waiting to hear from Martha’s Vineyard. First impressions are enduring. To me, Nantucket seemed warm and welcoming. To this day, despite friendships with many Vineyarders, I still think of their island as inhospitable and snooty, a place where people examine your stationary and, if the watermark is inferior, dismiss you as not worth the price of a postage stamp. This is unjust. We have since visited the Vineyard — once — and were treated with exquisite courtesy. My old uneasiness was revived, though, upon learning that its propertied classes regarded island beaches as private possessions not to be touched without the owner’s permission. In Nantucket there is scarcely a foot of beach not open to all of humanity that can get to the seashore. Miami Beach hotel owners of course enforce claims to ownership of the shore. At least one hotel there even lays claim to the ocean, announcing daily at sundown that “the ocean is closed for the night.” One expects this sort of megalomania from hotel syndicates, but what kind of human being wants to own the ocean? In Martha’s Vineyard, apparently, there were such people. Fear of being judged socially unfit, of being jugged for trespassing on the ocean, only partly explains why I haven’t set foot on the Vineyard since, and probably explains nothing at all about why most Nantucket summer people have never set foot there at all. The broader explanation is that Nantucket is sufficient unto itself. Having undergone the agonies always involved in getting to Nantucket, why would anyone want to leave for - horrors! - a trip to Cape Cod or - ho hum - a visit to the Vineyard? Every Nantucket fanatic knows that greed and real-estate speculation have turned Cape Cod into Calcutta-by-the-Sea, just as he knows that Martha’s Vineyard is a nice place to visit if you like the Pennsylvania countryside. If you’re Nantucket-minded you’re likely to smile a bit condescendingly about the Vineyard’s claim to island-hood. Compared to Nantucket, the Vineyard is an island only in the sense that Australia is an island, except of course that the Vineyard is jammed smack up against the mainland. You can see the thing with the naked eye from the Cape and get over there by ferry in 40 minutes. Call that an island? 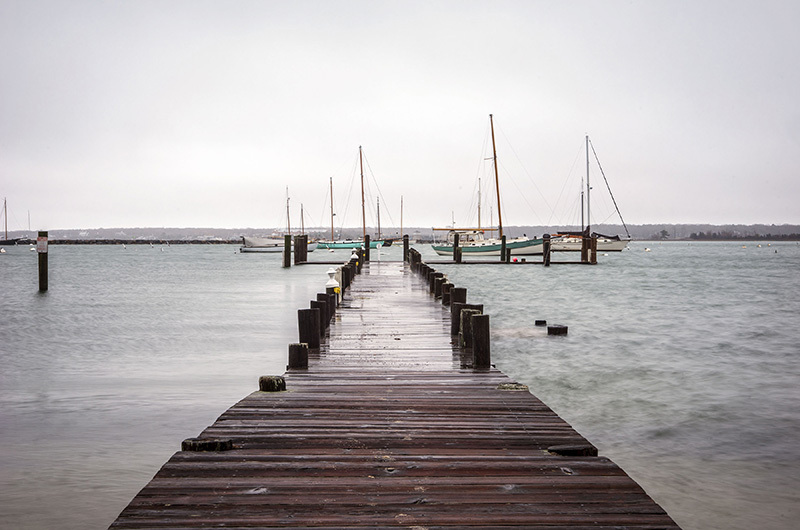 Raise a bridge from Woods Hole to one of those Chops they’re always talking about on the Vineyard and it would be as easy as getting from Manhattan to Queens. Nantucket’s people pride themselves on being on a real island. Miles out of sight from the mainland, a tiny mound of sand in the angry Atlantic, assaulted by the winds that have been gathering momentum all the way from Iceland — that’s an island, folks, not Pennsylvania. “The faraway island,” some antique chamber of commerce type dubbed it years ago, and “faraway” explains a lot of Nantucket’s allure. Just getting there is an adventure. There’s a quixotic car ferry that comes in two or three times a day when it isn’t broken down and everyone’s in the mood to make the trip and the weather isn’t acting up, but naturally they can never fit you on when you want to go. And of course you can get in by airplane if you’re canny about meteorology and cunning enough to squeeze yourself onto a flight schedule to arrive between fogs. I’ve often spent two days trying to get there from New York: and once needed four days to succeed. When you finally arrive you feel faraway, you feel you’ve really gotten someplace, you feel you’ve survived an adventure. Nantucket evenings are spent listening to tales comic and hair-raising about getting there, and when we get there we are proud of ourselves. It must be the way the pioneers felt when they finally got to Oregon. The Vineyard is a dull commuter’s trip from the mainland. Vineyarders never know the triumph of getting there. Let us state it plainly: Vineyarders are soft. They have it easy. They do not know suffering. No, we Nantucketers are not much interested in that sort of life. We were not made to loll in bosky Pennsylvanian glades and amuse ourselves with tales of hoi polloi successfully routed from our private oceans. We are people of fiber and grit in whom the brotherhood of the ocean air has bred democratic tolerance. We answer our mail. He had it right. On a deep winter night with all the visitors gone, stars glittering above like diamonds against black velvet, wind howling through wires and naked trees, you can walk the streets and feel like a passenger on a great abandoned ocean liner far out in the North Atlantic, outward bound toward God knows where. That’s some feeling. And you can hear majestic thunder from the beach as the ocean claws the land away, pounding and pounding, with nobody there to book it on charges of trespassing. Fair winds and aloha, Mr. Baker. I can relate to your comparisons, especially with respect to beach access. I first visited Chilmark as a guest of my in-laws in the '70s. On the first day, I ran down their ocean path to swim. I walked along the beach toward Lucy Vincent and noticed armed guards on a steep cliff. I was stopped at the water's edge and informed I could not walk any further. In Hawaii, beaches are 100% public, just as the gods intended. That day, I became a loyal member of the Ables Hill ' hoi polloi '. One thing Nantucket and the Vineyard do share is the water temperature. Yikes! Funny. Not the Russell Baker I remember. A little too sardonic and “knowing” for my taste and having been to both places...not what I recall. Although Nantucket is lovely, I have always felt it was prohibitively expensive and out of reach for all but the very wealthy who clearly claim it as a privileged right. Despite the high price tag of a Vineyard rental, I’ve never felt the gloss of exclusivity there. People seem more “average” there...even those who arrive on magnificent boats in Vineyard Haven Harbour are generally friendlier than those who claim Nantucket as their summer home. Finally this picky, somewhat hypercritical piece by a man whose work and life I have admired from a distance is just not the way I’d like to remember Russel Baker. Kind of sour don’t you think? this roofer from new jersey lives 45 min from the jersey shore and has for over 25 years traveled to the vineyard and past hundreds of miles of east coast shore line and beaches to get there. Having been to both islands and am able to chose between the both to rent on and from this article may have an easier time renting on Nantucket. I can't wait to get back to the Vineyard in Sept. Yes, perhaps a bit sour, but there is no denying his point about the beaches. ...Fear of being judged for saying, "IN Martha's Vineyard". Loved this. Thanks for printing. Thanks so much for reprinting Baker's column. Would have loved to hear Art Buckwald's response. why do we have private beaches? such a shame.